Triad’s Sidney Louck (left) gets bumped off line by a collision at the plate with Shawnee catcher Alise Moneypenny on Thursday. 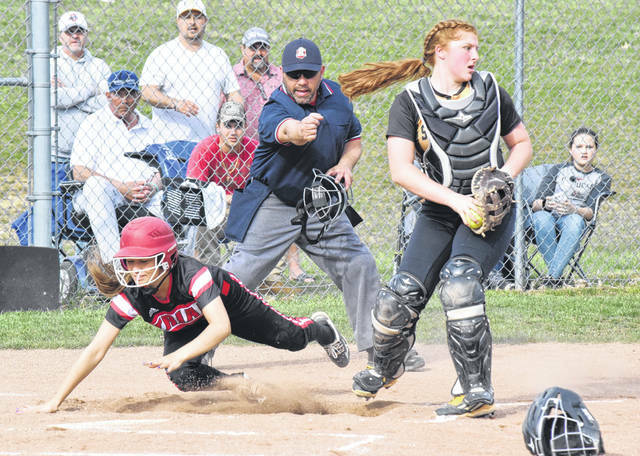 NORTH LEWISBURG – Shawnee clipped Triad, 4-2, in non-league softball on Thursday. The Cardinals looked solid for most of the game, turning a few terrific defensive plays in support of pitcher Joni Russell. But the Braves put all four runs together in the third inning, capitalizing on some sporadic control issues from Russell and hitting her fastball hard into play. Other than that fateful inning, it was a blank slate – aided by a double play on a ball scorched right at shortstop Kristin Bailey that picked a runner off of third base and a quick-thinking fake throw by Kendell Hughes on a ball hit down the line to third. That play, also with a runner on third, allowed Hughes to dive back to the bag and tag out the runner, eliminating the threat. In between, Holly Alvoid made a great running catch in shallow right field to hold off more potential scoring. The Cardinals were never able to fully mount a charge offensively, though, and it bit them. For the game, Hughes was 2 for 4 with a double and Shelby Sheets was 2 for 3. Triad (5-3) hosts Catholic Central today. SPRINGFIELD – Urbana lost to Kenton Ridge, 3-2, on Thursday in CBC boys tennis. In first singles, Ethan Burnside lost, 6-2, 7-6 (10-8). Second singles saw Ethan Headlee win, 6-0, 6-2. Jacob Coffey won in third singles, 6-1, 6-0. In first doubles, Michael Trudo and Troy Brown lost, 3-6, 6-1, 7-6 (10-8). In second doubles, Zach Hoskins and Kyle Rooney lost, 2-6, 6-3, 6-4.
https://www.urbanacitizen.com/wp-content/uploads/sites/36/2019/04/web1_SidneyLouck041119.jpgTriad’s Sidney Louck (left) gets bumped off line by a collision at the plate with Shawnee catcher Alise Moneypenny on Thursday.